During this hectic holiday season, wouldn’t it be amazing to have time to take baths, spend time in nature, get regular massages and cook delicious, nourishing meals that take half a day to prepare? But who has the time for that!?! Enter wellness gift ideas that encourage others to take time to care for themselves in order to be well, live well and feel well. Here are some ideas that inspire movement and progress for others along their own personal wellness journey. Gift giving feels good. When you create a moment of joy for another person it doubles the warm and fuzzy feelings for you both. Now, if it is not financially feasible to give gifts that cost money, there are many gifts that you can create on your own or time you can spend that doesn’t cost a thing! If you feel like you have the means and the desire to give others the gift of improving their health, wellness and overall quality of life, here is list of some ideas to offer the gift of health and wellness this holiday season. When you think of wellness, think of all the elements that make up a balanced, healthy, content life. Wellness comprises of relaxation, healthy movement and exercise, healthy eating, sufficient sleep, personal fulfillment and connecting with nature. Each area contains potential practices that encourage overall good health in mind and body. The following is a short list of ideas within each wellness area to spark your creative giving spirit! Giving a gift certificate for massage, infrared saunas or other healthy body work offers an amazing gift of cleansing, detoxing, relaxation and greater health and wellness. Candles, bath salts and essential oil diffusers with pure essential oils are also wonderful gifts that encourage inner peace, calm and relaxation. Just be sure to read ingredients and look for pure essential oils in both the candles and bath salts so as to not give out toxic chemicals! 2. Gifts for healthy movement. Giving a gift of a yoga class series, dance classes, barre classes or a health club membership encourages healthy movement. If there is another activity that you know the person either already does and enjoys or has expressed interest in doing, this is a wonderful way to give the gift of health and wellness. Fitness trackers and personal training sessions also encourage healthy movement to feel well in body and mind. Health and fitness gear such as a yoga mat, new shoes or clothing are also great gifts. 3. Gifts for healthy eating. The gift of a healthy dinner subscription such as Sun Basket or a subscription to a monthly local produce delivery of fresh healthy food is an amazing gift to give. You can also create a homemade basket that includes healthy food items to make a favorite dish, meal or beverage along with the recipe or cookbook makes a fantastic gift. You might put together some ingredients in a basket like herbs, nourishing broths, sea salts, olive oils and vinegars, cacao, chia seeds, walnuts, matcha, or find a beautiful healthy cookbook. Teas, preferably organic, are also wonderful gifts that are healthy and delicious! Kitchen items that encourage healthy eating are also great gifts, like a high powered blender (Vitamix is my favorite!- but any are great!! ), salad spinner or bowl, Instapot, tea pot with a nice strainer, stainless steel or glass water bottle with or without an infuser for herbs, spices and fruits. When you give a gift that encourages healthy eating, you are giving the greatest health insurance policy that exists! 4. Gifts for healthy sleep. The gift of sleep may be a challenging gift to give, but you can give items that encourage the possibility of rest and restoration! Sleep masks, sound machines, guided relaxations, relaxing music, binaural frequency sounds, a cozy blanket, pj’s or slippers encourage making sleep a priority and more available. A gift certificate for restorative yoga or meditation also help to make rest and sleep more available and there’s always teas and tinctures that can help you get more zzz’s. 5. Give gifts for personal fulfillment. Gifts that encourage a sense of fulfillment are super valuable. Items that encourage self-reflection, mindfulness and living more intentionally bring value and increased wellness to life. Gifts like adult coloring books, sketch pads, gratitude journals, blank journals, art supplies, music, gift certificates for a fun creative class, books, or other items that you know the person on your list would love goes a lot further for fulfillment than a new shirt or a tie! When you encourage someone to explore, be creative, learn something new or learn more about a passion they may have, you encourage their continued personal growth and evolution. What an amazing gift to share! 6. Give the gift of nature. Nature is healing. Spending time in nature is tremendously therapeutic. Giving something as simple and beautiful as a plant, flower, bulb or even seeds to begin to sow in the early spring creates an opportunity to connect with nature each and every day. Gardening items or items that encourage being outdoors such as a hammock, bench or wind chimes encourage spending time in nature. If you are thinking a little larger, you might give the gift of a trip to the mountains, some outdoor adventure or the beach. Encouraging the opportunity to connect with nature is a wonderful gift to give. This is a short list and it is intended to help spark some ideas that also allow for a personalized approach to giving. Finding “that just right thing” brings you a sense of pleasure and fulfillment. There may be other ideas you have that help to encourage others to live well, feel well and be well. I’d love to hear how you are sharing the gift of wellness to others this holiday season! Here in the U.S. it is Thanksgiving Day. This is a Day where you may celebrate with loved ones and take time to share with one another around the holiday table what you are grateful for. While this can be a wonderful expression of gratitude, when practiced every single day, it can change your entire perspective on life. A gratitude practice can improve your relationships and your attitude in general as it causes your brain to release feel-good hormones like endorphins. Having a regular gratitude practice is powerful and life-enhancing. Try incorporating the following practices daily and notice the impact on your mood, your energy, your relationships, your perspective of abundance and on your life as a whole. Practicing gratitude daily has been rigorously studied and proven to increase happiness as well as improve relationships. The first practice to implement is using a daily gratitude journal. Writing down two things you are grateful for every single day will have a powerful impact on your perspective of abundance in your life. When you take time to recognize all that you do have right now rather than all you wish you had, you create a positive experience of the present moment. Whether you are recognizing that you are grateful for what you may always have—like waking up in a warm bed or having a dishwasher creating some ease in your day—or for a kind gesture received from a friend or maybe someone held the elevator door for you when you were running late. Taking time to acknowledge the ordinary and the unusual creates positive, enriching feelings. When you write down what you are grateful for, take a moment to reflect on it. This creates an experience of savoring the memory, you are allowing that positivity to literally sink into your being and shift your internal experience. You are increasing the “feel-good” hormones in your brain and body. Keeping a gratitude journal is a powerful tool to maintain a record of all of the good that exists in your life. Reflecting on what you have written in the past when you are feeling a sense of lack or feeling down can serve as a way to shift from a deprivation and down space emotionally and lift you back to a space of contentment. Try keeping a gratitude journal and notice the powerful impact on your life. The second gratitude practice is telling your partner, child, loved one or friend something you appreciate about them each and every day. Harvel Hendrix, a long-time couples therapist said that couples that tell each other two things they appreciate about each other at the end of the day—every day—have more satisfying and long lasting relationships. This is similar to keeping a gratitude journal, it is just a verbal experience where you get to feel the positive feelings of “reliving” a positive element you noticed in your day. Even if you are not currently in a relationship, you can have this shared experience with someone you care about, be it a friend, coworker, family member or child. Tell someone you care about what you appreciate about them and why. See how it feels for you to uplift someone. When something you did for a person you care about is reflected back to you, it creates a positive internal experience of feeling appreciated. Having that happen in a shared moment allows you to feel close as you end the day with a positive shared experience. Try this practice as well and notice the impact on yourself as well as your relationships. The last gratitude practice I encourage you to try in order to build happiness and contentment in your life, is writing a gratitude letter. It has been shown that the experience of writing a gratitude letter and sharing it with the person you are grateful for can lift a mild depression for two weeks. That is incredibly powerful. Giving back, being kind and lifting up someone else naturally creates a positive internal experience. Ideally you can deliver and share the letter in person, but if you can’t that’s ok! Mail it, and see how it feels. Shifting from a sense of lack to a sense of abundance, from a space of wanting to a space of being grateful for and content with exactly what you have right now is freeing. Moving from fear of loss to awareness of and gratitude for the present moment can have a profound impact on your mind, body and spirit. Creating a space for these gratitude practices and consistently engaging with them will create the most powerful results. When you try these practices, notice the impact on your life and let me know how they work for you. If you are one of the many people who struggle with emotional and stress eating, then you may be dreading the holiday season. Whether because the holidays themselves are stressful or just the addition of holiday treats being everywhere all the time is stressful—or both, stress and emotional eating can become especially rampant this time of year. It starts with the Halloween candy. You might think to yourself, “I’ll have just one piece---you know---as a treat.” The next thing you know you have an empty bag of Reese’s Cups and you are at the store purchasing two more bags of Reese’s—because now they’re on sale, 2-for-1! You do not have to spend another holiday season fighting yourself! Here are three simple and highly useful strategies to help you manage your sugar intake, be more mindful with your choices, and make it through this holiday season feeling empowered, healthy and strong rather than disappointed, frustrated and hopeless. According to the American Heart Association, women should have no more than 24 grams of added sugar per day and men no more than 36 grams of added sugar per day. For example, a Pumpkin Latte from a certain coffee spot has 49 grams of sugar! When you begin to pay attention to how many grams of sugar are in certain foods, you can make more empowered decisions about what to eat and how to “spend” your sugar grams each day. 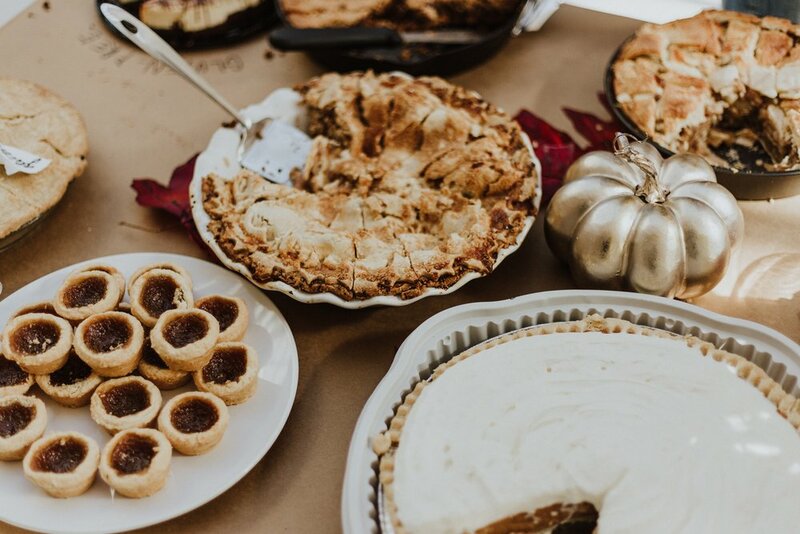 During the holiday season you might choose to increase your daily sugar quota by a bit more than 24 grams, or you might make certain days exceptions, but just not every single day—which is where the trouble lies during this season! When you predetermine how much sugar you will take in daily, you are more likely to pay attention to the amount of sugar in foods and more likely to make informed decisions. This allows to you to feel strong and in control rather than weak, shameful and deprived. When you make decisions based on how you want to feel, you are more likely to make an empowered and positive choice in the moment. Start each day with asking yourself “How do I want to feel today?” If you want to feel strong, ask yourself with each decision you make around food and in general, “does this choice support how I want to feel?” If not, you have an opportunity to make an empowered choice to say NO to that particular food while choosing to say YES to yourself, YES to how you want to feel. There is no better feeling than showing up for yourself and making empowered choices! This stops the feeling of deprivation and builds inner strength. At holiday meals, (and all throughout the year!) aim for at least 50% of your plate to be loaded with vegetables. When you do this, you are not only getting in the nutrition you need, the fiber in vegetables helps to fill you up and create a feeling of satiation. This leaves less space for the sugary foods—both on your plate and in your belly! Vegetables are where “it is at” nutritionally! When you are taking in more nutrients you feel better. This sets you up to manage your stress more effectively, which helps you curb the stress-eating! When you are well nourished you tend to have fewer cravings which allows you to resist the second helping of pie at the holiday table! Use these three strategies during this holiday season and notice how they impact your choices, your ability to manage your craving and how you feel about yourself. When you try these strategies, let me know how they work for you! Receive 3 Step Cravings Protocol + the latest health tips + recipes delivered straight to your inbox.